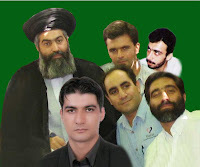 We are five opinion prisoners who had gathered along with hundreds of other people in the house of Ayatollah Seyed Hossein Kazemeini Boroujerdi,the Iranian anti-dictatorship clergy, to prevent from his illegal detention ,26 months ago( Mehr 1385, Oct 2006). Unfortunately we were wildly attacked and arrested by governmental security forces, police and governmental factors in personal cloths (not wear uniform). During first months we were put under various tortures, severe investigations and imposed confessions in 240 and 209 sections of Evin prison. Thereafter we have been in prison about one year. unfortunately Special court of Clergy set our indictment based on accusations which were perfectly opposed to our previous background and social personalities such as defiance, action against national security, sabotage in public order, spreading felicities, involvement with police forces, taking part in illegal gatherings, communicating with foreign countries, spying, etc. there were no opportunity to defend ourselves in closed court sections were held without independent lawyer. At first we were condemned to severe punishments and long imprisonments, eventually our verdicts decreased to 2years chastisement imprisonment during several steps. All verdicts notifications and summons were oral. Factually, our crime is just supporting a religious and popular leader regarding his ideas on separation religion from state, deletion of discrimination and also freedom of speech, belief and choosing religious freely by everyone that he obviously mentioned in his speeches, interviews and his correspondences, as well. He called religious government in the age of not being prophets as religious dictatorship and ideological exploitation. "adaptation to the brutal dictator, silence and escaping from country "and in fact he was supporter of oppressed people. We hereby by repeated sympathy toward all victims of freedom of speech and belief, request from all real and juridical personages who are worried about liberal men in chains to follow up this case as soon as possible.